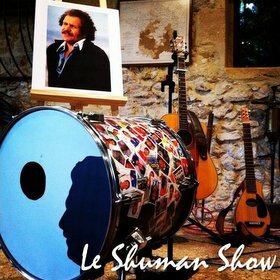 The fourth episode of the monthly Invisible Bordeaux podcast is now available for your listening pleasure and features quality French-language conversation with Deux Degrés, the good people behind Bordeaux Safari, the interactive roleplay guidebook which was the star of an adventure on the blog some time ago, and which has just been given a full makeover with the release of a brand new edition. But, as we are about to find out, the Safari concept has been rolled out across other cities in France (Nantes Safari being the most recent addition), and Deux Degrés are much more than a publishing house, describing themselves as an "agence de médiation" providing a platform and channels to connect local authorities with citizens. 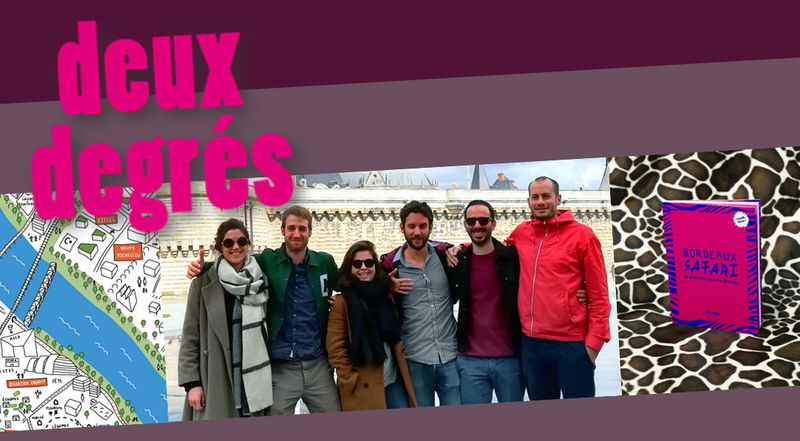 The full story can be heard below, as delivered by urban planner Gabriel Bord and designer Julianne Huon, both project leaders at Deux Degrés (pictured fifth and third left on the group photo above). Here then is the podcast, which you'll also find on miscellaneous platforms including Anchor, Apple Podcasts/iTunes, Spotify, Google Podcasts, Breaker, PocketCasts, RadioPublic, Overcast, Podbean, Podcast Addict and Stitcher. Feel free to hit the subscribe button on the platform of your choice! And scroll on down for all the links you need to find out more about Deux Degrés. Click here if player does not display properly on your device. A few months ago, Invisible Bordeaux published two compilations of clocks that can be seen in the streets of the city (you'll find the pieces here and here). 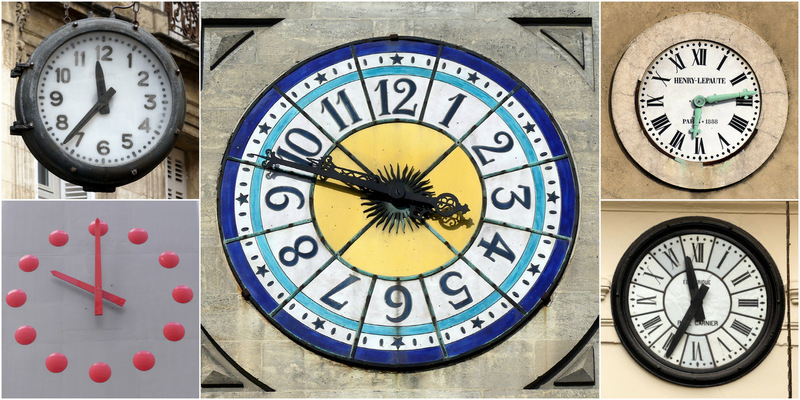 Inevitably, there were other clocks that also deserved their 15 minutes of fame on the blog, so here, ticking away nicely for your delight, is chapter 3! 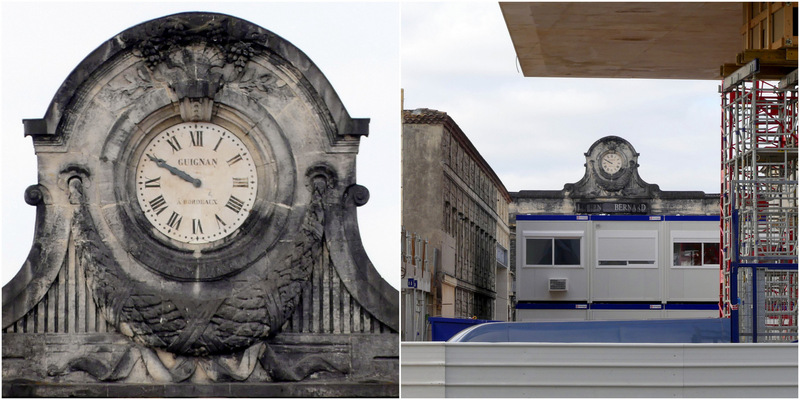 The city's former slaughter house and meat market on Quai de Paludate was first built in 1938. In its brand new incarnation as the Boca food court, the clock has been refurbished and can be spotted just above the old market price displays! 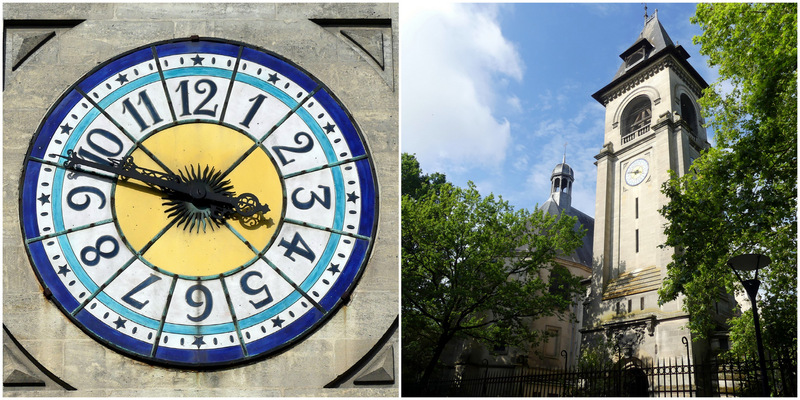 This colourful offering (note also the subtle stars alongside each number) can be seen on three of the four sides of the bell tower of Saint-Bruno church, located between the Mériadeck quarter and Chartreuse cemetery. This delightful clock can be found in the 19th-century Passage Sarget shopping arcade just off Cours de l'Intendance. 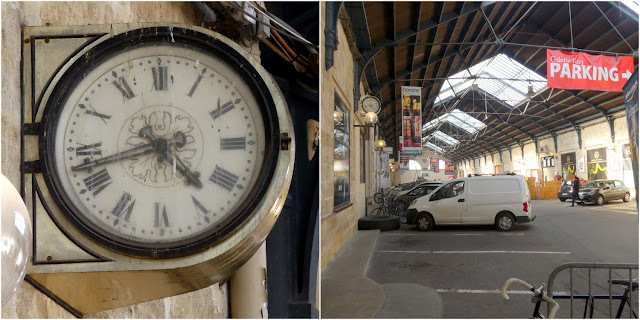 It proudly announces itself as being "électrique" and was the work of the company founded by watchmaker and mechanic Paul Garnier (actually Jean-Paul Garnier), best known for railway station clocks that can be seen in France and, for some reason, Romania. 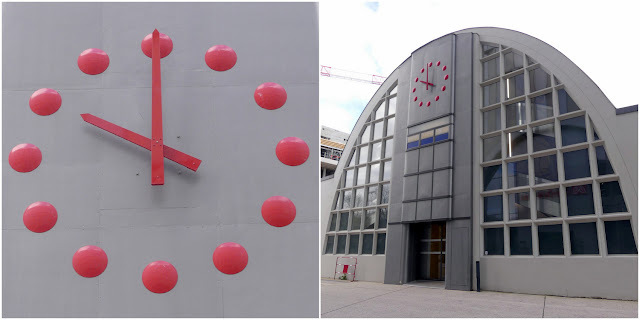 This clock can be seen on the side of an otherwise nondescript building in the Bassins à Flot docklands district. The naval nature of the area may have been particularly appealing to the associated clockmaker Henry Lepaute, who also traded as a mechanical engineer specializing in lighthouses. This clock is not currently in working order. 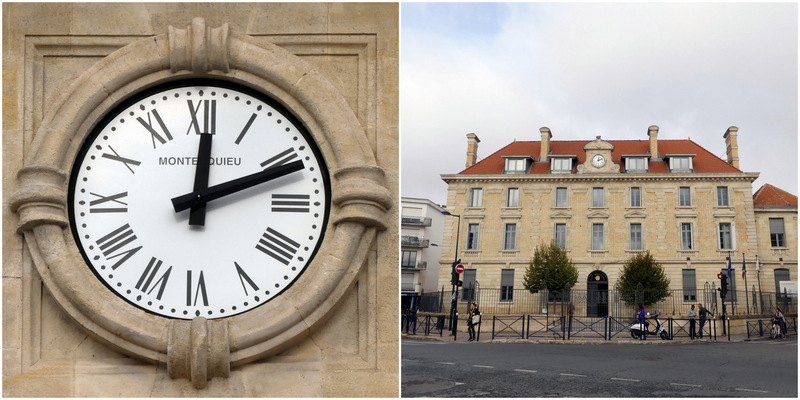 This suspended, double-sided street corner clock on Place Puy-Paulin was manufactured by Pilon. It appears to have loosely inspired the logo of the Puy Paulin bistro that can be found at ground level (judging by their website). Amusingly, Saint-Michel basilica may be one of Bordeaux's grandest places of worship, but it comprises a disproportionately small clock. 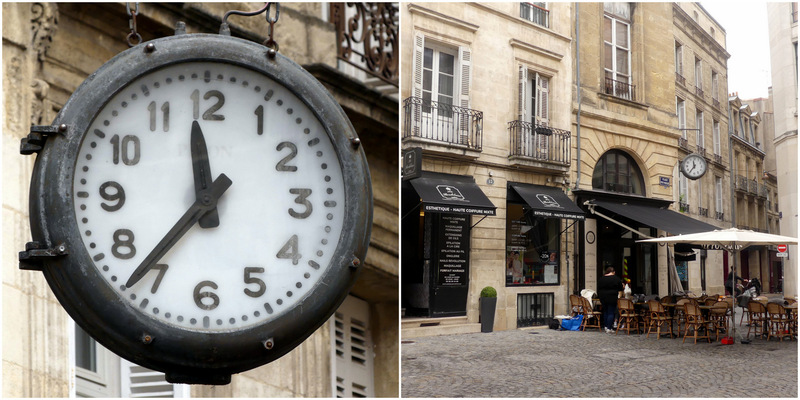 We encountered Bordeaux clockmakers Guignan during the first rounds of Invisible Bordeaux clocks: Gaston Guignan founded his business in 1850 and the company operated for 100 years. Another Guignan clock, a near-identical model, can be spotted from a distance within the grounds of wine traders Lucien Bernard in the Belcier (now also known as Euratlantique?) district near Saint-Jean railway station. Currently out of order. Students hanging around outside Lycée Montesquieu near Jardin Public do not need to refer to their mobile phones to keep track of time, as this clock does the job just fine. Interestingly, it is self-branded, with the school's name written on the clockface. 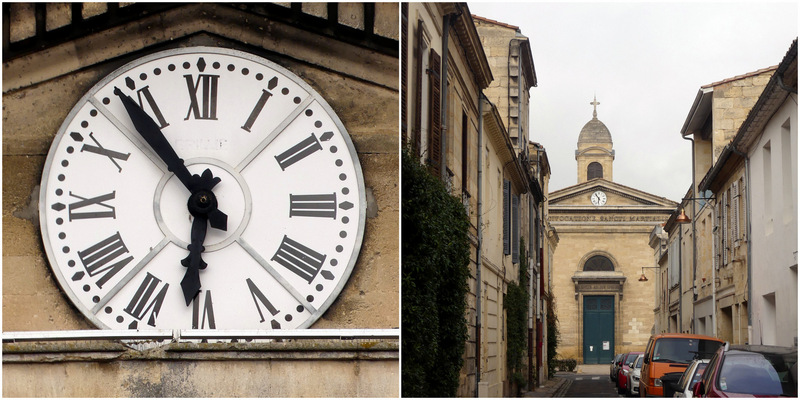 This four-quartered clock, which is currently out of order, can be seen on the exterior of Saint-Martial church in the Chartrons district. Like others documented in previous Invisible Bordeaux compilations, this was the work of Levallois-Perret clockmakers Brillié. 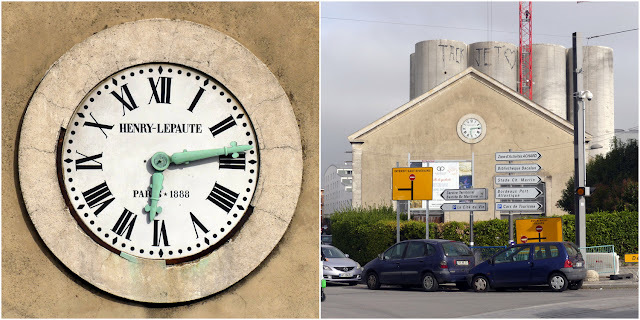 This double-faced clock can be found in Galerie Tatry in the Chartrons district. It is also out of order. Despite being under cover, it appears to be a popular haunt for birds, hence its current state of dirtiness. OK, so this clock is not in working order for obvious reasons (it's stuck on 3 o'clock!). 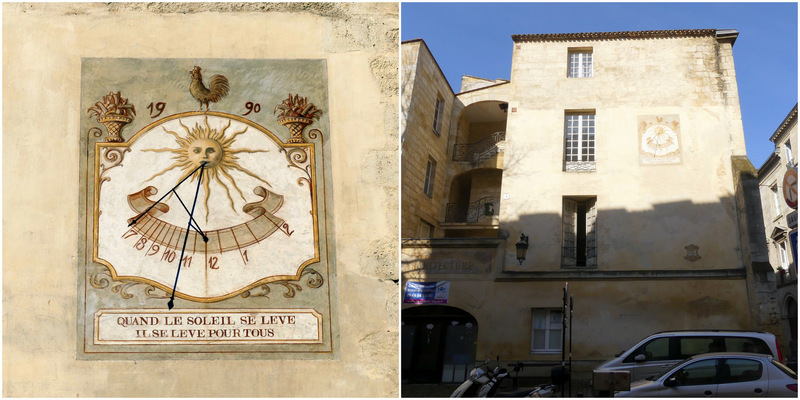 It can be seen on Rue de Grassi, next to the Fémina theatre. 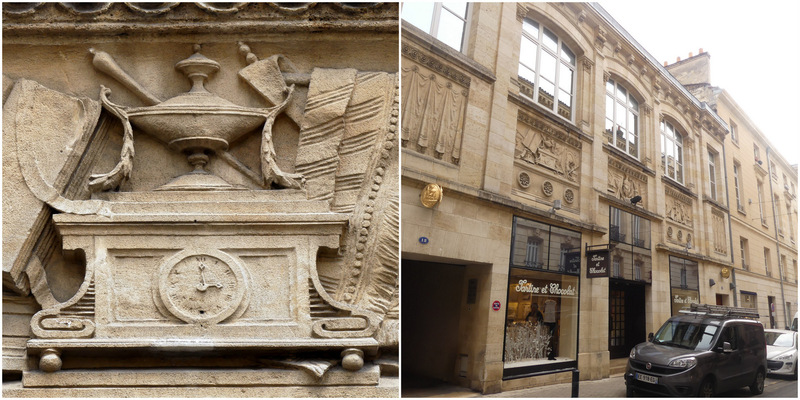 According to Robert Coustet's Nouveau Viographe de Bordeaux, the bas-relief feature was conceived by the architect Jean-Jacques Valleton to enhance the exterior of this 1877 building, which was originally a public auction house. The carvings therefore represent the kinds of objects customers might have expected to be bidding on. 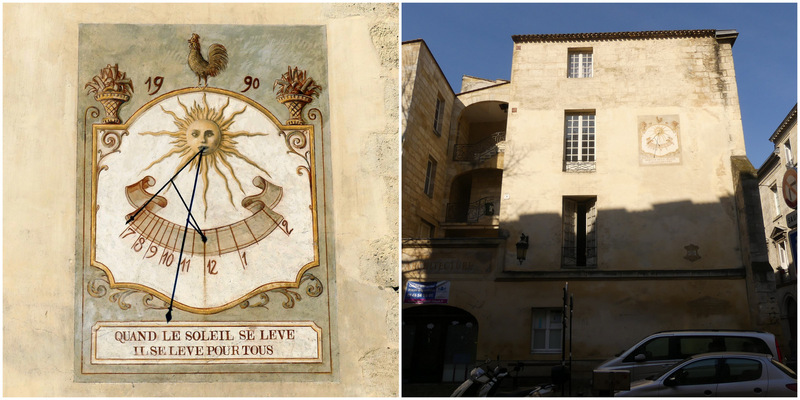 We'll finish off with this 1990 handpainted sundial on the south-eastern flank of a building on Rue du Puits-Descazeaux (the small square has even unofficially been given the name Place Raymond-Colom). As you can see, given the direction in which it is facing, the clock is only operational until early afternoon. When I was there on a sunny day in February, it was more like 11:30, not 10:30 as displayed, so whoever conceived the sundial permanently set it to summertime hours! 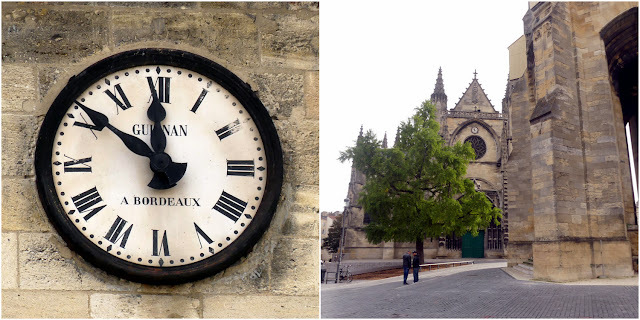 > Click here for part 1 and part 2 of the Invisible Bordeaux clock compilation! > Big thanks to readers Philippe Billé and Conchi for suggesting some of the clocks that feature on this page! > Cet article est également disponible en français ! > All these lovely clocks have also been stuck back-to-back in this short motion picture. Sit back and enjoy! After ten years of extensive refurbishment work, the Muséum de Bordeaux - Sciences et Nature, the city’s natural history museum, reopened to the general public in March 2019. Invisible Bordeaux was lucky enough be given a private tour of the museum, so this way please for an exclusive heads-up! The rebirth of the Muséum is the latest chapter in its long history, which stretches back to the end of the 18th century when two eminent local dignitaries - the academic Professeur Latapie and the ship-owner Bernard Journu-Auber - donated their private collections to the city on the premise that they be put on public display. Bordeaux upheld that promise, initially in the Hôtel de l’Académie on Place Bardineau, before transferring the pieces to a former private mansion house, Hôtel de Lisleferme, within the grounds of the nearby Jardin Public. This move occurred in 1862 and the ever-expanding inventory of the Muséum has remained there ever since. This is how it looked the day Invisible Bordeaux was there, but this photo will be updated shortly once the fences have been removed! Fast-forward then to the early years of the 21st century, by which time the ageing premises were no longer fit for purpose. The decision was therefore made to renovate and extend the museum, with a view to meeting new and stringent safety norms for visitors and exhibits alike whilst enhancing the building’s green credentials, to make the visitor experience as enjoyable and accessible as possible, and to totally revise and modernize the circuit to appeal to new audiences and expectations. All of the above was to be achieved by combining the respective talents of architect Sébastien Loiseau and his agency Basalt Architecture, the Franco-German interior designers Die Werft, the local graphic design agency Studio Kubik, multimedia specialists Drôle de Trame and digital interaction agency Opixido. Part of a colour-coded permanent exhibit in the reception area. Furthermore, interior work on the main building was also delayed by a major hailstorm in May 2018 which resulted in substantial flooding and damage. This was an unexpected event which, Julien says, “had a massive impact on team morale, but everybody quickly pulled together to overcome this massive setback”. What can visitors expect? At any given time, the museum showcases around 4,000 exhibits, and given the aforementioned extent of the full collection, a number of temporary (lasting four to ten months) and semi-permanent (duration of three to five years) exhibitions are planned on various themes, meaning that no two visits will ever be exactly the same. 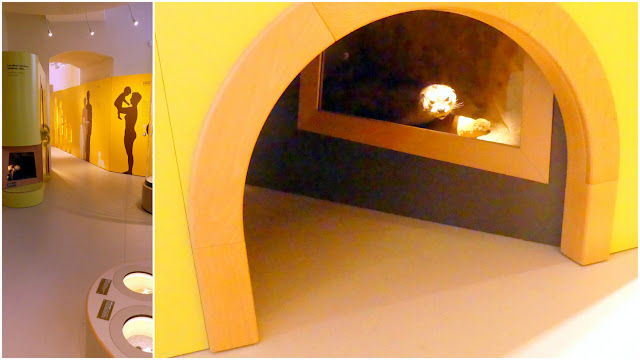 The first, long-term semi-permanent display is focused on the Aquitaine coast, utilizing modern staging techniques to highlight local species of wildlife. Part of the "Littoral Aquitain" exhibit. On the top floor of the building, the impressive “Galerie Souverbie” delivers the Muséum’s permanent fixtures, featuring timeless cabinet displays that hark back to museums of old, but that are combined here with intricate lighting, modern video and cutting-edge multimedia resources that bring the exhibits in line with 21st-century technological capabilities. Julien mentions that, in all, the Muséum now boasts no less than “22 interactive terminals, 18 video displays and 10 listening stations comprising content that will be evolving over time for various audiences and events”. 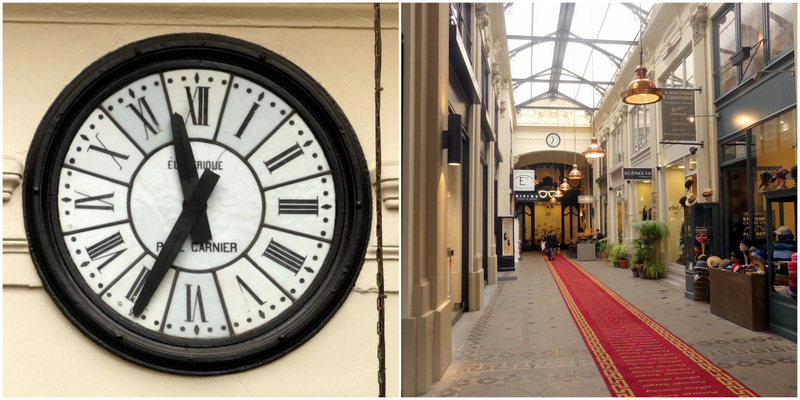 Some of the permanent exhibits in the magnificent "Galerie Souverbie". During my visit the team was trying out various lighting configurations, making for atmospheric shots such as this one! There are many other innovations to be witnessed, and which digital communications trainee Marthe Spielmann also proudly details during our visit. One is the “Early Years Museum” area on the ground floor, “where everything in terms of messaging and format has been adapted to children aged six and under, working around the theme of gestation, birth, growth and development”. Inside the Early Years Museum. them to be far more mobile than previously, and freeing up more space for the exhibition proper. An additional change which has also freed up space is that all the museum’s administrative offices have been transferred to the neighbouring pavilion, meaning that in the main building almost every square inch is dedicated to the visitor experience, maximizing exhibition space and accessibility. In fact, the Muséum has actually grown in surface area by opening up a whole new 500-square-metre exhibition area located underground, beneath the terrace area that lies in front of the building. Julien explains that this new set of rooms “will be used to host temporary exhibitions, starting out with a show entitled “Très Toucher” focused on the sense of touch, along with a look back on the renovation of the Muséum. Forthcoming exhibitions include one about laughter, and one about African wildlife”. Down in the new basement exhibition area. Further innovations lie behind the scenes, such as the installation of a drain water heat recovery system which is fed by pipes that cross the Jardin Public. The heat and energy extracted and harnessed from domestic waste water is regulated by heat pumps on site, and enables the Muséum to be heated during winter months and cooled during summer months, making this 18th-century building one of the most eco-friendly places around! Behind-the-scenes drain water heat recovery pumps! Finally, one aspect which I have found particularly striking over recent months is the way the Muséum has embraced social media, regularly feeding their Youtube, Facebook, Instagram and Twitter channels with fun and informative updates about work in progress, whether showing exactly what it takes to displace a giraffe (AKA "Kailou") or an elephant ("Miss Fanny", previously a fairground attraction, acquired by the city upon her premature death aged 33 in 1892), to one-on-one interviews with members of the 20-strong “équipe fantastique” who have brought the Muséum back to life. Do check them out, although the content available there is, like this article, just a trailer for the real thing! > Find it on the Invisible Bordeaux map: Muséum de Bordeaux - sciences et nature / Natural History Museum, Jardin Public, Bordeaux. > The Muséum is open every day except Mondays, 10:30-17:30 (October > March), 10:30-18:00 (April > September). > Admission: 7 euros when temporary exhibitions are on (concessions 4 euros), 5 euros when there is no temporary exhibition (concessions 3 euros). Admission for children: 3 euros at all times. > Big thanks to Julien Diez and Marthe Spielmann for warm welcome and the fantastic personal visit! The third episode of the monthly Invisible Bordeaux podcast is now available for your listening pleasure and features quality French-language conversation with Mickaël Baubonne, the man behind the Métro de Bordeaux association, which aims to develop a metro/regional railway network in and around Bordeaux between now and 2030. The project is seeking to resolve mobility and public transport congestion issues currently being encountered in the area, and has been built around thorough research into the subject that is detailed in a full report available online. During our conversation we touch on the feasibility, scope and scheduling of the project, as well as what makes this different to the previous VAL concept which emerged in the 1980s. Here then is the podcast, which you'll also find on miscellaneous platforms including Anchor, Apple Podcasts/iTunes, Spotify, Google Podcasts, Breaker, PocketCasts, Podbean, RadioPublic, Overcast, Podcast Addict and Stitcher. Feel free to hit the subscribe button on the platform of your choice! And scroll on down for all the links you need to find out more about the Métro de Bordeaux initiative. > A public information meeting about the project will be held on Thursday April 11 2019 at 18:30 at Espace Malbec, 250 rue Malbec, Bordeaux. Follow Métro de Bordeaux's various channels for additional information. After spotting a tweet published by one Matt Guenoux, featuring an aerial timelapse of Roissy Charles-de-Gaulle airport taking shape based on pictures available on the fantastic IGN Remonter le Temps website, I thought it might be interesting to attempt something similar for Bordeaux, and quickly came up with the idea that the Mériadeck quarter would be the perfect subject matter! 1924: The tight grid of narrow roads that made up the old, residential Mériadeck quarter, crossed from top to bottom by rue Dauphine, which later became rue Docteur-Charles-Nancel-Pénard (one of the streets that lead onto Place Gambetta). Among the sights clearly visible and that will remain so throughout the 95-year sequence: Chartreuse cemetery and Saint-Bruno church to the left, the Palais Rohan city hall and gardens to the right of the centre, Saint-André cathedral to the right, and the Palais de Justice law courts, bottom right. 1950: The focal point of the picture is still the square-shaped Place Mériadeck, a meeting point and hive of activity for locals. 1956: To the immediate north of Place Mériadeck, a square plot has been cleared to make way for the area's first high-rise building. 1961: The Résidence du Château d'Eau tower block has gone up. It turns out to be the only building to be completed from the original plans for the district. 1965-66: Further demolition work has cleared other plots close to Résidence du Château d'Eau. To the south, new modern extensions to the Ornano fire station are built (inaugurated December 1966). 1967-70: Far more space is cleared and the rectangular Post Office building has now appeared. 1973: Place Mériadeck is wiped off the map for good. 1976: The whole southern flank has become a building site, the first cross-shaped apartment and office blocks have appeared in the north-western corner, the circular, Guggenheim Museum-like Caisse d'Epargne building is beginning to take shape, and a huge chunk has been cut out of rue Docteur-Charles-Nancel-Pénard. 1979: New arrivals include the Mériadeck shopping centre (which opened the following year), the Gironde préfecture building and, less visible from above, the Communauté Urbaine de Bordeaux block (now Bordeaux Métropole). 1980: Raised walkways between the different sections appear, further cross-shaped apartment blocks appear on the southern flank. 1984-85: The star- or flower-shaped Patinoire skating rink (and arena-circuit concert venue) emerges bottom left. The trees and water features of the central esplanade are clearly visible. A little further to the east, just to the north of Place Pey-Berland, the Saint-Christoly shopping centre and apartment block is being built. 1989: The Lego-brick-like Aquitaine regional offices can be spotted over by Chartreuse cemetery, while the south-eastern corner of the area now boasts Novotel and Ibis hotels. A little further to the west, the municipal library has gone up. 1991-96: Opposite the library, the Conseil Départemental de la Gironde has installed its new premises. From this point onwards, most of the available space is occupied and new developments are few and far between. 1998-2000: The most notable addition to the area is the Richard Rogers-designed law courts over on Cours d'Albret. 2004: Nearby, Place Pey-Berland has been closed to road traffic to accommodate the new tram network and becomes fully pedestrianized. 2010-12: The Mériadeck effect extends to the north-east, as modern apartment blocks go up across the road from the La Poste building. Judged to have aged badly, the La Croix du Mail building is demolished and makes its way for the Cité Municipale, that can be seen in the 2019 GoogleEarth shot. Of course, there is plenty more to spot. 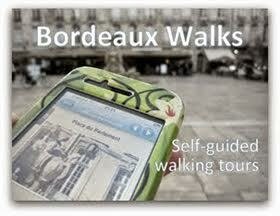 Do get in touch if Invisible Bordeaux has missed out on something, whether vital or trivial! It is 10:18pm on Thursday 24 September 1959. At Bordeaux-Mérignac airport, a Douglas DC-7C propeller-driven aircraft (the very one pictured above, registered F-BIAP) readies for takeoff on the second leg of TAI Flight 307, the regular connection operated by the French airline Transports Aériens Intercontinentaux (TAI) between Paris and Abidjan, the capital of Ivory Coast, via Bordeaux and Bamako in Mali. 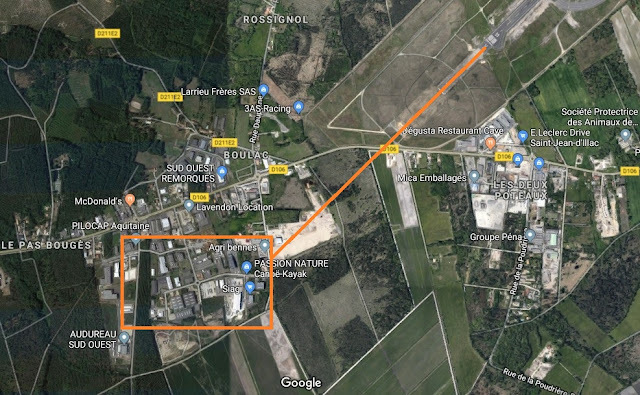 The Mérignac stopover has lasted two hours and everybody on board – nine crewmembers and 56 passengers – is in good spirits as the plane levels up on runway 23, the airport’s main takeoff and landing strip. There is moderate wind and a light drizzle, but visibility is fair. Chief pilot Maurice Verges and copilot Jean Bouchot are given the all-clear by air traffic control and at 22:23 the DC-7 sets off on its eight-hour flight to Bamako. After routinely leaving the ground the aircraft ascends to an altitude of 30 metres but fails to climb any further and even starts to drop. At a spot situated just over 1,000 metres from the tip of the runway, some 2,950 metres on from its initial departure point, the plane clips some of the tall trees (22.5 metres high) that form the dense “Landes de Boulac” pine forest on the territory of the village of Saint-Jean-d’Illac. Knocked off course, the right wing becomes damaged and the plane falls to the ground, the fuselage breaks up into pieces and wreckage is instantly strewn over a distance of several hundred metres. 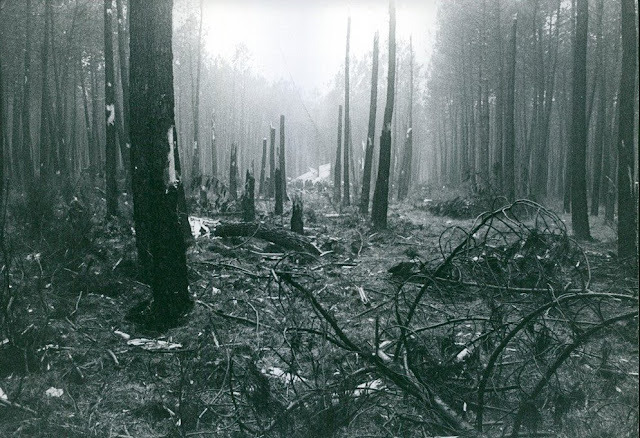 Multiple explosions occur resulting in a number of fires which quickly spread to the trees, although the damp ground prevents the fire from extending beyond the crash site. Top right: the tip of Mérignac airport runway 23 (or 05 if approaching in the other direction), and bottom left, the approximate crash site, much of which now comprises small industrial units. Wreckage was spread over several hundred metres, mainly to the area that lay to the right of the aircraft's trajectory (orange line). Map/satellite data: Google. In the immediate aftermath, rescue efforts are hampered by darkness and the sheer inaccessibility of the area; the rudimentary road structure means emergency vehicles are unable to approach any closer than 800 metres to the impact site. Miraculously, twelve passengers are found to have survived, having been thrown from the aircraft. They are rushed to hospital in Bordeaux, where one will later die. The crash of TAI Flight 307 therefore ultimately results in the death of 54 people, including all crewmembers. A picture of the crash site, with wreckage visible in the distance. Picture credited to International Magazine Service for Paris-Match/Marie-Claire, source: Amazon. So, what happened? In the report into the investigation released by France’s Bureau Enquêtes-Accidents de l’Inspection générale de l’aviation civile, sécurité et navigation aériennes (nowadays simply referred to as the BEA, Bureau d'Enquêtes et d'Analyses), three key factors were earmarked. Firstly, the two-year-old aircraft’s lights were not in operation. This may not immediately strike you as being an issue, but it is when combined with the second factor, namely that there were also no lights on the ground in that area to enable the pilots to have a sense of how low they were. Which takes us on to the third and most critical factor of all: the pilots were not paying attention to the altimeter and therefore had absolutely no knowledge of how low they were flying. When replicating the same conditions during a reconstruction flight in Brétigny, near Paris, the Bureau established that an increase in speed during a very short critical phase (lasting around 10 seconds beginning 40 seconds after full throttle) can considerably reduce the aircraft’s rate of climb or even cause a loss of altitude, and that with a lack of visual references the pilot “may follow a line of flight that will bring the aircraft back near the ground if, during this period, optimum climbing speed is not maintained and the altimeter is not carefully watched”. Returning to the scene of the crash today, much of the area is occupied by small-scale industrial units, although immediately beyond that a wide expanse of farming land can be found, along with clusters of dense pine forests, much like the area where TAI Flight 307 crashed. Even now, it is easy to imagine how isolated and out-of-reach the crash site must have been in 1959, despite being so near to what was already a major airport for its time. One section of the woods where I go wandering appears to have been transformed into a makeshift rubbish dump, which doesn’t seem to be the most dignified of destinies for this historic site. The scene in the area today, with a dense pine forest still thriving to the right. A closer look at part of the forest of apparently young pines. As I’d expected, unless I missed something there is no information panel or memorial of any kind to the tragic events of September 1959 on site, but to the southern flank of Chartreuse cemetery in central Bordeaux a lasting tribute remains. For that is where you will find the final resting place of copilot Jean Bouchot (aged 32), mechanic Yves Gosse (32), trainee mechanic Raymond Savina (38), steward André Paupy (28) and air hostess Chantal Perrault de Jotemps (35), along with the remains of 14 passengers bearing the names Barge, Bordelanne, Darlan, Delaunay, Duchamp, Duhart, Dussaut, Mensah, Morris and Tanon. Sixty years on, this air disaster – the most deadly to have ever occurred in the area – seems to have faded into the mists of history, so hopefully this article will help keep the memory of the event alive, and possibly even raise awareness of that sad night in 1959 when a Transports Aériens Intercontinentaux DC-7C sadly failed to reach its destination. > Find it on the Invisible Bordeaux map: TAI Flight 307 crash site, Boulac district, Saint-Jean d’Illac & TAI Flight 307 grave and memorial, Chartreuse cemetery, Bordeaux. > Information for this article was also culled from aviation-safety.net and the official BEA report of the investigation into the accident. which features many other picture postcards issued by former airlines. > Ce dossier est également disponible en français. The second episode of the monthly Invisible Bordeaux podcast is now available for your listening pleasure and features quality French-language conversation with the multi-talented, multi-dimensional artist Nirina Ralantoaritsimba. Nirina first got in touch with me around the time she released her novel Nous sommes les ancêtres de ceux qui ne sont pas encore nés. This alone would have been a good enough reason to touch base, but I then realised she was also a film-maker (her latest offering is the short-form film Bumper) as well as operating in a number of other fields, from painting and calligraphy to tuition! Here then is the podcast, which you'll also find on miscellaneous platforms including Anchor, Apple Podcasts/iTunes, Spotify, Google Podcasts, Breaker, PocketCasts, RadioPublic, Overcast, Podcast Addict and Stitcher. Feel free to hit the subscribe button on the platform of your choice! And scroll on down for all the links you need to delve into the wonderful world of Nirina Ralantoaritsimba! > For up-to-date information about Bumper (Le Créneau in French) check out the film's Facebook page or else Nirina's website. 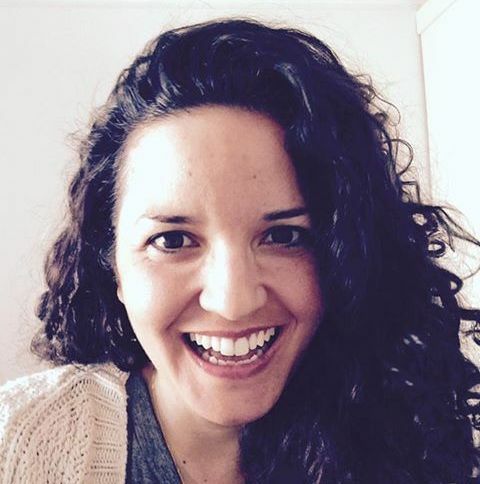 > Nirina's web series Mon week-end chez Mémé, Scribo and many other videos are available on her Youtube channel.